Home » Carpet Cleaning » What are those black streaks on my carpet? We hear this question a lot, and as it turns out in most cases it’s not mold or water. It’s a condition called “Carbon Deposition” or “Filtration Soiling“. Here is what it is and what you can do about it. Before continuing it’s important to note that while black streaks around the edge of your carpet most often indicate that it’s not mold or water, it is possible, although unlikely, that it could be either which is why it should be inspected first and not automatically assumed to be mold, water, or even filtration soiling. And several other environmental factors. When these air exchanges occur, the pressurized air seeks the path of least resistance, which is oftentimes the area where the floor meets the wall. When homes and buildings are built, the studs are nailed or screwed to the floor. Next, drywall or paneling is typically nailed or screwed to the wall. The drywall usually does not stretch the full height of the wall because it would be difficult for the contractor to fit the wall over the studs, so oftentimes there is a gap at the floor where the drywall or paneling is installed. When the wall is finished baseboards are installed, which cover over this gap. The last step is to install carpeting. Now that you can visualize air pushing and pulling at the path of least resistance (the gap behind the baseboards where the drywall is above the floor) with pressure changes, you’re probably wondering why it’s black there. Enter: microscopic soil and soot. What is microscopic soil and soot? Every home and building has some degree and type of airborne particulates. We call this “microsoiling“. Using an air filter on your furnace helps to knock down the larger particulates, but some particles are so tiny that they can still slip through or around the filter. Indoor air filters can also assist, but the same principal applies: some microsoiling will make its way through or around the filter. Where does microsoiling come from? These microsoils mix with the indoor air and become pressurized and depressurized. 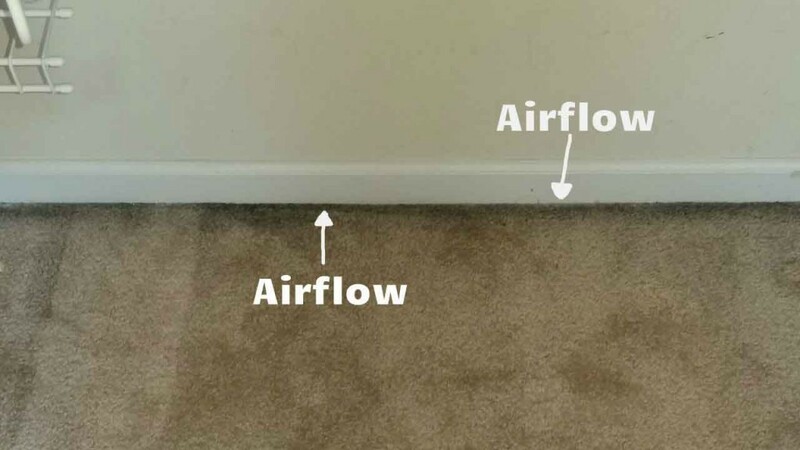 This now-contaminated air always seeks equilibrium, meaning it seeks to find the path of least resistance, which is oftentimes right there where the carpet meets the baseboard. As the air travels across the carpet at the baseboard, the microsoiling is deposited on the carpet fibers which builds up and becomes more noticeable over time. In other words filtration soiling doesn’t just happen overnight. It slowly accumulates and causes gray and then black lines to occur on the carpet at the edge of the baseboard. Please note: If you normally do not have filtration soiling issues and suddenly see them one day, you may have a cracked furnace, hot water tank, fireplace insert, or flickering pilot light. Another red flag is if your furnace filter has oily black soil on it. This is a potentially dangerous situation and you should have an HVAC specialist check it immediately. How am I assured this filtration soiling is not water damage, or mold? It can be tricky or even impossible to clean it all off. Normal soil is much easier to clean than microsoil/filtration soiling for the simple fact that the particle size is much larger on normal soils. Filtration soiling particulates are so small that they can impart inside and between the structure of the carpet fibers themselves; even into the dye sites, which are the microscopic areas of a synthetic fiber that accept dyes. And because microsoiling is mostly caused by carbon deposits it requires the use of high-pH products, aggressive agitation, or both, followed by extraction. The trick is to use the right products and proper agitation without damaging the carpet fibers, which is no easy task. Can I prevent it from happening or recurring? 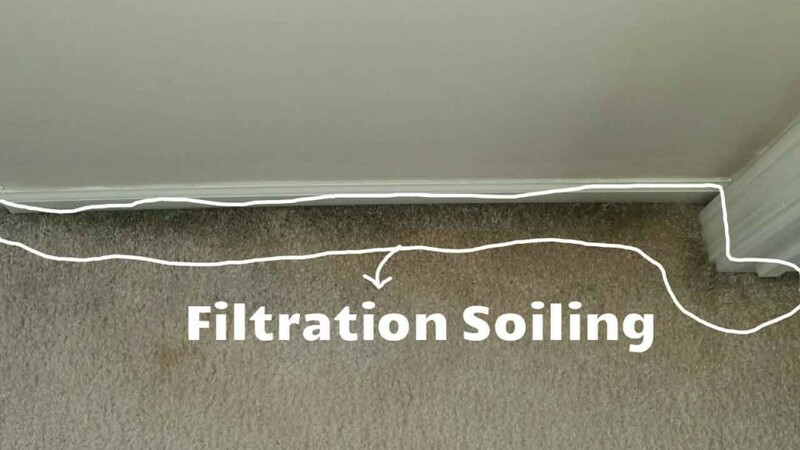 You are now well-prepared to take on those ugly black streaks on the carpet edge, otherwise known as Filtration Soiling. As always, we are more than happy to answer your questions or help in any and every way possible. Our number is 810-225-2184.